We would like to thank all of you for taking the time to visit the Limekiln Wind Farm website and for providing us with feedback regarding the wind farm proposal. We are using the website to keep ourselves informed about the issues that local residents may have and to open the door to a two-way communication process. This section of the website will be updated with answers to the questions raised by local people during the consultation process. As a starting point we have provided answers to a number of the most commonly asked questions. How many households would Limekiln Wind Farm generate electricity for? Is wind power enough to reach our renewable energy targets? How much CO2 will Limekiln save? Will there be a lot of construction traffic going through our villages? Will the local economy benefit from having a wind farm nearby? How much energy actually goes into the manufacture, construction and operation of wind power schemes? Can this energy ever be re-captured? What is the pay back time of Limekiln Wind Farm? How big will the turbines be? 1. How many households would Limekiln Wind Farm generate electricity for? The wind farm will generate enough electricity for around 43,600 homes. This has been calculated on the basis of the annual household energy consumption of 4,700 kWh and a capacity factor of 30% (assuming a 78MW capacity). 2. Is wind power reliable? A modern wind turbine produces electricity up to 85% of the time, generating different outputs dependent on wind speed. In a study done by Oxford University, it was found that in the UK, the windiest country in Europe, the wind is always blowing somewhere and a diversified portfolio of wind power developments would deliver electricity during all hours. One of the main advantages of wind power is that the available wind resource is much greater during the colder months of the year, when energy demand is at its highest. It is important to note that conventional power stations are also unable to operate continuously. Many energy sources deemed to be reliable such as (nuclear) power plants suffer from unexpected ‘outages' when reactors must be shut down, often at short notice, for essential safety maintenance. Unreliability of this kind is much greater to deal with than the intermittency of wind power, as the amounts of electricity involved are generally much higher. By comparison the variation in output from wind farms distributed around the country is barely noticeable. Moreover, power plants are severe pollutants that keep us depending heavily on imported fossil fuels from politically unstable countries. Where oil, gas and coal have strong adverse effects on our environment and will eventually run out, wind is free, clean and abundant in the UK. 3. Do we need renewable energy? Yes, and for a number of different reasons, but as the UK's Chief Scientific Adviser Sir David King said: "In my view, climate change is the most severe problem that we are facing today, more serious even than the threat of terrorism." 4. Is wind power enough to reach our renewable energy targets? There is no single answer. We need to minimise energy consumption and encourage all renewable energy sources. Today, the most developed and effective renewable technology is wind power. Almost everybody, when asked, supports renewable energy and most people support wind power. But when a wind farm is proposed nearby, there is sometimes a shift in attitudes. And that is the problem, not all of us want wind farms in our back yards. Despite the fact that wind power is supported by 70-90% of the public and has clear environmental advantages, there can be fierce local opposition against new developments. This presents problems for planners and decision-makers as they seek to balance the concerns in the locality against the wider benefits to the environment. (Source: Sustainable Development Commission). A comprehensive study by the Scottish Executive found that those living nearest to wind farms are their strongest supporters. 5. Is intermittency a problem with wind energy? It is a common misconception that because wind blows intermittently, and turbines can sometimes be seen motionless, then wind power is unreliable. But this is not true. The entire electricity system needs back-up, practically all the time, because fossil fuel and nuclear power stations are variable, much like wind energy. Power systems have always had to deal with variations caused by power station breakdowns /repairs /maintenance, as well as constantly fluctuating consumption. Large power stations (coal, gas, nuclear) can go off-line instantaneously, whether by accident or for maintenance, causing a massive loss of power. When a fossil fuel or nuclear power plant trips unexpectedly, the network can lose a 1,000MW or more instantly. That is true intermittency. Back-up plants must step in to meet the shortfall. Electricity consumption also fluctuates constantly - a sudden cold spell means everyone turns on the central heating; a break in a popular TV programme means everyone rushes to switch the kettle on. But we expect instant power for lights, TVs, computers, whatever the weather, whatever the time. Variations in wind energy, and other energy sources, are ironed out because there are many units in operation, of different types and back-up is always available. The UK system will not notice the shutdown of a 2 MW wind turbine, but it will have to respond to the loss of a 500 MW coal plant or 1,000 MW nuclear plant. Wind energy does not suddenly trip off the system. The wind does not blow continuously in one place, but there is little overall impact if the wind stops blowing somewhere - it is always blowing somewhere else. The more wind farms that are built over a wider geographical location, the more reliable wind energy is. On average, turbines generate electricity of varying amounts for around 80% of the time and have a capacity factor of around 30%, which compares well with gas and coal that have capacity factors of a little over 50%. This is in addition to the fact that the wind is a ‘free' fuel resource. The capacity factor figures given here should not be confused with efficiency (a coal fired power station has an efficiency of around 35%). The claim that wind needs constant back-up is not true. National Grid has to ensure there is sufficient capacity to respond rapidly to a sudden increase in electricity demand or sudden loss of supply. This spinning reserve is not there because of some variability in wind - it is there for all power sources. If a coal generator trips, up to 500 MW is lost instantaneously; a reactor trip at a nuclear station will lose up to 1,500 MW instantaneously. That's true intermittency and that's why there has to be spinning reserve. Variations in wind energy, and other energy sources, are ironed out because there are thousands of units in operation, of different types, and back-up is always available. The UK system will not notice the shutdown of a 2 MW wind turbine, but it will have to respond to the loss of a 500 MW coal generating set or 1,000 MW nuclear plant. Wind energy does not suddenly trip off the system. There is little overall impact if the wind stops blowing somewhere - it is generally blowing somewhere else. The more wind farms that are built over a wider geographical location, the more reliable wind energy is. 6. How much CO2 will Limekiln save? CO2 emission savings, which if totally displacing fossil fuel generated power, could alone amount to over 2.1 million tonnes over the 25 year life cycle of the wind farm based on approximately 24 years after estimated carbon loss from peat (4 months) and turbine manufacturing (7 months) has been deducted. 7. Do wind farms affect tourism? 8. Do wind farms affect property values? There are currently some 80 wind energy projects operating throughout the UK, and survey evidence to date does not reveal a negative trend in property values amongst properties in proximity to wind farms. According to the Royal Institution of Chartered Surveyors, there are no studies that suggest an effect either way, but at Nympsfield in Gloucestershire, house prices continued to gain after plans for the turbine were announced in 1992 and have continued to increase since the turbine began operating in 1997. There is currently no evidence in the UK showing that wind farms have a long-term impact on house prices. An extensive study was completed by a US Government-funded agency in 2003. This study examined around 25,000 property sales records over six years, straddling the pre- and post-construction periods of individual wind farms. The wind farms were built between 1998 and 2001. The study undertook three types of statistical assessment for each of 10 wind farm developments (a total of 30analyses), looking at the immediate vicinity of the wind farm and at comparable communities without a wind farm. The study found that in26 of these analyses, property values within 8km of the turbines actually performed better than in the comparable community. Two separate surveys around the Taff Ely Wind Farm in Mid-Glamorgan and Ardrossan Wind Farm in North Ayrshire drew similar conclusions. In Wales, Chartered Surveyors and planning consultants Dalton Warner Davies (DWD) looked at house sales around the Taff Ely Wind Farm in Mid-Glamorgan over a three-year period, with some properties only approximately 1km from the wind farm. The survey, carried out in 2006, found that three areas of housing had expanded since the wind farm began operating, and that asking prices were unaffected by having a direct view of the wind farm. A comparison of ‘for sale' prices and original sales prices at 38 properties revealed a 91% increase between2002 and 2005, compared to an 85% increase between sales prices over the same period elsewhere in Wales. Six local estate agents were also contacted and all reported that the wind farm did not have any effect on house prices. "Between 2000 and March 2004, values in the survey area on average increased by 23.1% compared to 7.4% for the Scotland-wide statistics. Similarly, from March 2004 [when the wind farm became operational] to date, property values in the survey area increased by 26% compared to the Scottish average of 17.1%. "There have been a number of studies conducted which establish that this is not the case. There is no clear evidence of effects on property prices. A new report in March 2007 from the Royal Institute of Chartered Surveyors (RICS) and Oxford Brookes University has blown away the myth about wind farms negatively impacting on house prices. The research found no clear relationship between the proximity of wind farms and property prices, and suggested that this may be an urban myth with apparent changes in value disappearing when examined closely. Recent research from the Edinburgh Solicitors' Property Centre (ESPC) (February 2007) focusing on property sales near Crystal Rig wind farm in the Scottish Borders found no evidence of a negative impact on the price of property in nearby areas. The ESPC study found that prices in the village of Dunbar had risen from below to above the regional average over the past four years, during which time the wind farm was built, and that since the wind farm began operating, property price inflation in Dunbar has continued to exceed that achieved across East Lothian. Other Independent, expert studies in Wales and Scotland have compared the increase in house prices near three operating wind farms with house prices further a field. Rather than a drop in house values, all three studies showed a faster rate of price increase in the houses near the wind farms. This is supported by a 2003 American study based on 25,000 homes within a 5-mile radius of various wind farms which again found an increase rather than a decrease in values. 10. Are wind turbines noisy? 11. Are wind farms built with taxpayers' money? How does the ROCs system work? The UK wind industry is financed by private investment - there is no government subsidy for building wind farms. The support mechanism, known as Renewable Obligations Certificates (ROC), is only available for electricity that wind farms have already produced and supplied to utilities. All forms of renewable and non-renewable energy receive subsidies in one form or another. The Nuclear Industry has received £70billion in Government subsidy for its decommissioning programme. Conventional fossil fuels such as oil and gas receive tax breaks for exploration and research and development. Renewables Obligation Certificates (ROCs) are issued by Ofgem, the organisation that regulates the electricity and gas markets in Great Britain. ROCs have been designed to increase the profitability of renewable energy generation in order to help meet national and regional renewable energy targets. A ROC is a green certificate issued to an accredited generator for eligible renewable electricity generated within the United Kingdom and supplied to customers within the United Kingdom by a licensed electricity supplier. One ROC is issued for each megawatt hour (MWh) of eligible renewable output generated. The Renewables Obligation, the Renewables Obligation Scotland and the Northern Ireland Renewables Obligation are designed to incentivise renewable generation into the electricity generation market. These schemes were introduced by the Department of Trade and Industry, the Scottish Executive and the Department of Enterprise, Trade and Investment respectively and are administered by the Gas and Electricity Markets Authority (whose day to day functions are performed by Ofgem). 12. If constructed, what turbines would be used on the site? At this time, Infinergy have not confirmed the model of turbines to be used at the wind farm site, as this will be subject to availability and new developments within the turbine industry. We are not proposing to use second-hand turbines or older models, but will use new, state of the art machines. 13. Will there be a lot of construction traffic going through our villages? The proposed route for turbines to travel is from Scrabster harbour on the A836 to the site. The specific site access will be determined over the coming months. As part of our extensive studies, we undertake transport assessment work. The strategic access route has yet to be finally determined, but will be drawn up in consultation with the Highways Authority at Highland Council. 14. What about the community benefit scheme? 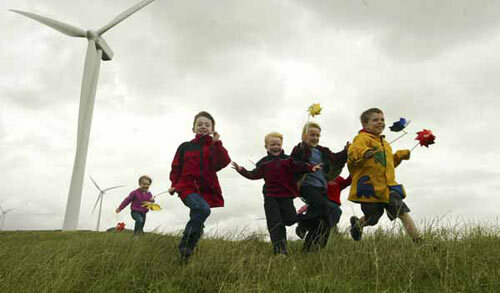 Infinergy believe that the local community should benefit from the development of a wind farm. For instance, a wind farm that moves to the construction stage can create opportunities for local contractors. Furthermore, Infinergy is keen to support the community on local initiatives. Therefore we would like to look at a number of different kinds of benefit, contributing to initiatives that have already been set up locally and looking at other areas of eoncomic benefit in conjunction with the community, local authority and enterprise agency. Infinergy will donate revenue from the project to the community fund. Typically this amount has been around £2,000 per megawatt installed per year, which for the Limekiln Wind Farm could mean a total of approximately £156,000 per year or £3.9million over the 25 year lifespan (assuming an installed capacity of 78MW). In addition, we are keen to investigate the possibility of investing in skills development and local initiatives to help improve the economy, perhaps in areas relating to tourism for example. We would appreciate your suggestions regarding the community benefit package, and we will be tracking all suggestions that come in. We hope to be able to help provide support to the local communities and we are aiming to gather feedback on ideas from all the surrounding communities. We will welcome all suggestions and hope to make this a positive contribution to the area. 15. Will the local economy benefit from having a wind farm nearby? The local economy will benefit in a number of ways. Caithness businesses have a great deal of experience and expertise in this field. Infinergy will encourage the employment of local people wherever possible and all the construction staff will inevitably spend money in the local economy at newsagents, petrol stations, hotels etc. Infinergy also has a policy of maximising the use of local contractors. During operation there will be on-site jobs as well as the community benefits package. 16. Will local energy costs go down because of the wind farm? It will not be possible to supply individual houses directly with the electricity produced from the Limekiln wind farm, although we hope that this will change in the future. The electricity from the scheme will be fed into the National Grid, which in turn could be purchased from your electricity provider. How much your provider charges is not in our control and given the Government system in place to encourage more renewable generation we know that our bills are going to increase in the short term, but that contribution won't be huge. We do believe that with more demand for green electricity, it will one day become cheaper than electricity produced by conventional methods (i.e. the burning of fossil fuels). One area of renewables that does have a direct impact is community owned micro generation schemes including wind, hydro and solar. These are becoming more and more popular and may well be something the community around Limekiln considers in the future. 17. Does the UK have sufficient wind to make wind farms work? The average wind speed at Limekiln is approximately 7.5 metres per second above ground level, which is equivalent to 27 kilometres per hour or 16.5 miles per hour. In order to seek reassurance, Infinergy will erected a met mast on site which measures the wind at 80m. The met mast will gather wind data for one year and will provide the developer with accurate on site data (Source: DTI Wind Speed Database). 18. There is so much industrial pollution and energy consumption in the developing world, are wind turbines in the UK really going to make a difference to climate change? 19. How much energy actually goes into the manufacture, construction and operation of wind power schemes? Can this energy ever be re-captured? What is the pay back time of Limekiln Wind Farm? The Sustainable Development Commission (SDC) recently summarised the output of some of these studies in their report Wind Power in the UK: A guide to the key issues surrounding onshore wind power development in the UK (2005). Although there will be carbon emissions relating to the Limekiln wind farm development from the manufacture of turbines through to the operation of the wind farm, it is estimated that the total emissions for the life time of the development will be ‘paid back' within 11 months of construction, resulting in an overall positive influence on the carbon balance. If utilised as alternatives to fossil fuels, the overall cumulative effects of renewable energy developments, such as the proposed Limekiln Wind Farm, will assist in the reduction of air pollutant and greenhouse gas emissions at a national level. 20. Why don't we put all the wind turbines out to sea? 21. How long do wind turbines last? Modern wind turbines are designed to operate for around 25 years and at the end of their working life, the area at Limekiln can be restored at low financial and environmental costs. The land could be used for a wind farm again but that would require planning permission based on a new planning application. During the wind farm's lifetime, routine maintenance will be required. Wind turbine technology is rapidly evolving, with all of the major manufacturers making frequent changes to their model line-up and technical specification. For the Limekiln wind farm, as elsewhere, it will be necessary for the make of turbine to be confirmed through a tendering process prior to the commencement of construction. The Environmental Statement will be based on maximum dimensions of an existing 3MW tubine. 23. How big will the turbines be? The size of the wind turbines will depend on the capacity they can generate. For this windfarm we are looking at varoius types of turbines with a generating capactiy of typically 3MW. These 3MW turbines tend to have a hub height of up to 100m and a maximum tip height of 145m.